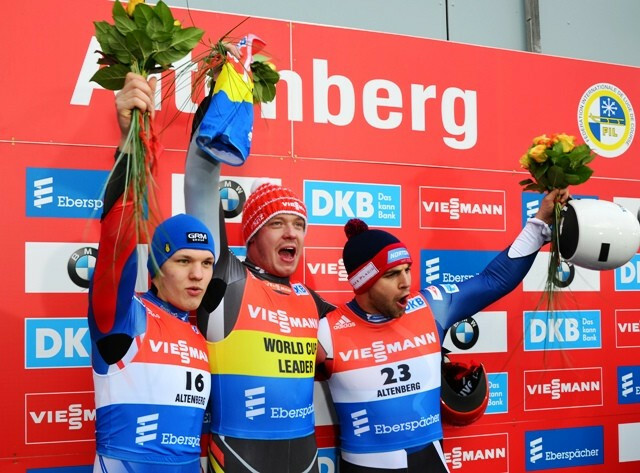 Germany’s Felix Loch claimed the men’s European crown and overall International Luge Federation (FIL) World Cup title by recording the two fastest runs in Altenberg today. Following a slow start to the season, the three-time Olympic gold medallist has proved unbeatable in recent weeks. He has won six consecutive World Cup events and earned world titles in the singles, sprint and mixed team competitions at Königssee. The prospects for his rivals looked bleak when Loch topped the standings in an event that also included the European Champinoships after the first run as the 26-year-old from Sonneberg recorded a time of 53.780sec. Loch sealed the win by clocking 53.776, the quickest time of the day, to see him end on 1:47.556. World junior champion Roman Repilov secured the European Championship silver medal by finishing in 1:47.885. Loch’s compatriot Ralf Palik clinched the bronze medal with 1:47.928. The result ensures Loch cannot be caught in the overall World Cup standings. The German lies 150 points clear of Austria’s Wolfgang Kindl, having moved onto a tally of 890. The three-time Olympic gold medallist can now head to the final World Cup of the season in Winterberg next weekend assured of achieving the triple crown consisting of the World, European and World Cup titles, for the second time in his career. The German last achieved the feat in 2013. “I have led the way by achieving the triple, so now my favourite football team Bayern Munich has to follow suit,” Loch said. “I don’t actually have any secrets. German success continued in the doubles competition as Toni Eggert and Sacha Benecken achieved a time of 1:22.890 to win the competition. The World Cup holders held off the challenge of their team-mate Tobias Arlt and Tobias Wendl, who finished in 1:23.269. The podium was completed by Austria’s Peter Penz and Georg Fischler in a time of 1:23.471.